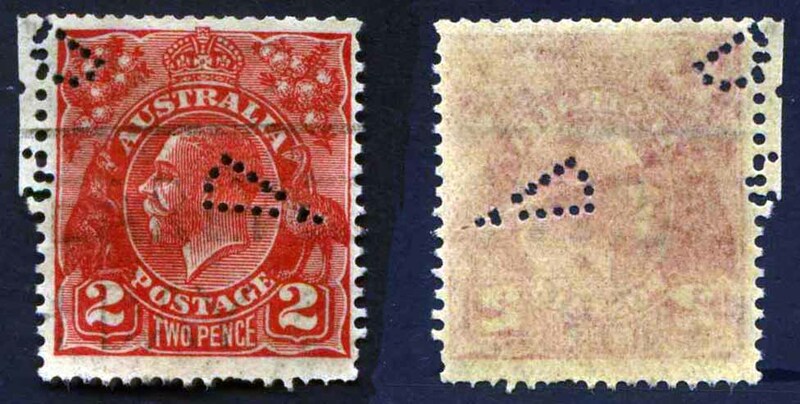 These are clearly service punctures which most likely places them in Melbourne and this is supported by the postmark on the left hand one . 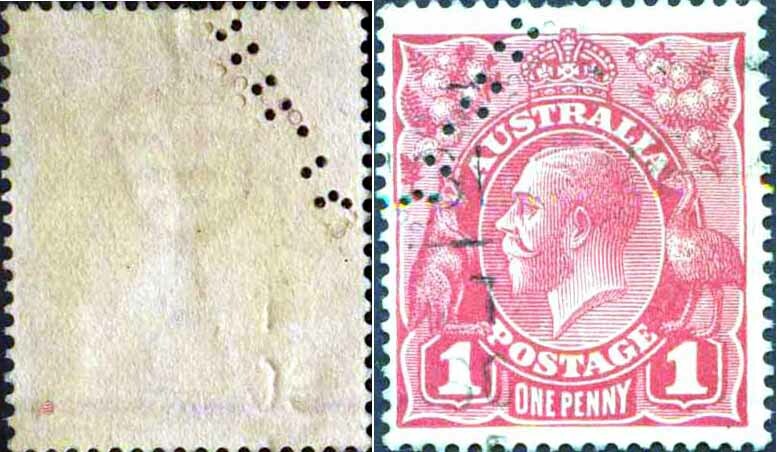 HAPP does not list a DM pattern but there is an early pattern series of other service punctures for DMO from around 1904 – 5 and like these it was Melbourne based. The poor pattern structure is consistent with later work of the service puncture vendor Thomas Moulden whose sight deteriorated and this effected the accuracy of his work. Does anybody else have any of these DM’s if so please share them with us. DWS is not a known pattern. The pattern may have been poorly set up and it is possible that it is meant to be WDS. 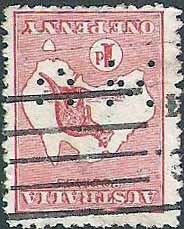 There are a series of WDS’s found from about 1916 – 1920 but these are much later than this strike of 1900. The pattern is so well set up that it is hard to accept that the operator transposed the D and the W.
There is the possibility that the D and W are parts of 2 separate strikes but in order to accept this you need to accept that the operator set up the S off to the left of the W . Also the W and the D are clearly in line and as service punctures are created from single head strikes such consistent relationships between strikes are unlikely. I think that DWS is most likely a new pattern. When is a perfin not a perfin? When it is personalised stationary. I can not be sure who Hancock was , there was a famous W J Hancock at this time in Western Australia involved with the development of the Telegraph, but it is hard to image that he was holidaying in Melbourne at Christmas in 1989 and decided to bring his perforating device with him to puncture a Victorian Post Card. These cards are quite thick and with a wide pattern like this a good clean strike would require a quite large and cumbersome device. 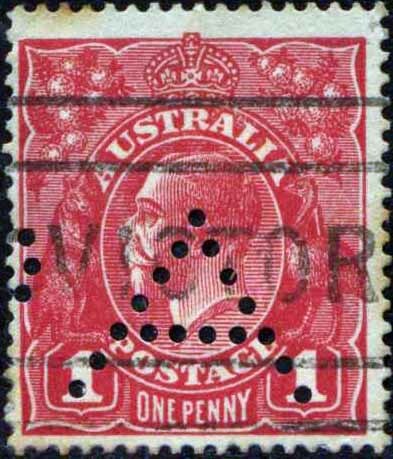 The orientation of the name means that it is best read from the rear of the card and given that the script of the words “Dear Sir” mingles with the pattern but show no distortion it is most likely that the pattern was applied after the card was completed. This is certainly not what you would expect if the pattern was designed as a security device. Does anyone else have strikes like this with names? The below 'D with wedge' was recently sent to David Coath for identity, below is what David had to say. The pattern has 2 clear parts. There is the D at the top and there is the piece at the bottom that looks like a wedge. The top part of the wedge also has characteristics of the same D and although it does not line up with the pattern above it may be the start of another DJLTD strike. There seems to be a crease down the middle of the wedge just as if you were cutting up a cake. I think if you folded the stamp along this crease that then you would likely find that the two sides of the wedge where struck by the same pins and are therefore part of a D strike. 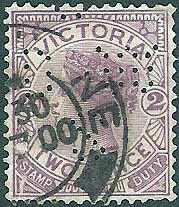 The fact that the J etc is missing from both partials is because the stamp was tucked away from the punch head. The point of the wedge would therefore be the top 2 pins of the L underneath the D but again folded over. would need to see the stamp to confirm my view but you should be able to overlay it on a DJLTD.2 from HAPP to see if I am even close. The below was recently sent to David Coath for identity, below is what David had to say. 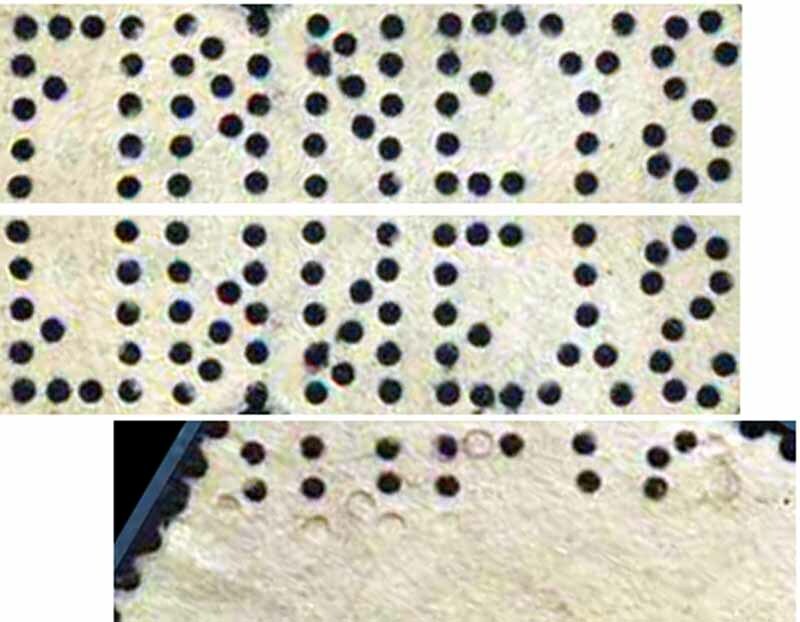 This is an easy one - FINNEYS Finneys was a Queensland Company and from c1918-1920 the pattern 'FINNEYS' was virtually halved by many broken & missing pins. 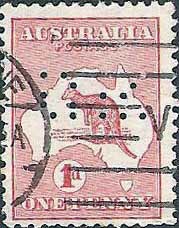 Although the use of the FINNEYS pattern on railway stamps ceased in 1914 the device continued to be used on postage stamps of Australia until about 1920. Is it a true pre-cancelled perfin company initial or just a cancelling device? You the viewer may have the answer.